Sometimes an album hits you at just the right time at just the right mood. That's what happened to me with Thumbtacks + Glue, the forthcoming album from Woodpigeon (out Feb. 26th). I've never really been smitten with Woodpigeon's music. I've found it pleasant but unremarkable. Thumbtacks + Glue represents a seismic shift in my view. It combines beautiful melodies with well-crafted lyrics and just enough innovation to make it stand out from the indie folk crowd. The Calgary-native Woodpigeon uses hushed Elliott Smith-style vocals and an incredibly addictive melody turn "As Read In the Pine Bluff Commercial" into a masterpiece of understatement. Verses are traded with a female lead on the equally stunning "Little Wings". Orchestrals layered atop the folk foundation transform "Children Should Be Seen and Not Heard" into a grand accomplishment. It's a sweeping sound that is shared on the cinematic "Edinburgh". A layer of darker rock provides some oomph to "Sufferin' Suckatash", making it a powerful epic statement. "Robin Song" adds a hook that makes it unforgettable without sacrificing any of the dramatic impact. 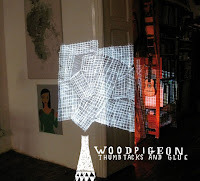 In Thumbtacks + Glue, Woodpigeon has given us a record that may turn out to be a darkhorse contender of Album of the 2013 when we start those discussions later in the year. Best tracks: "Children Should Be Seen and Not Heard", "Sufferin' Suckatash"